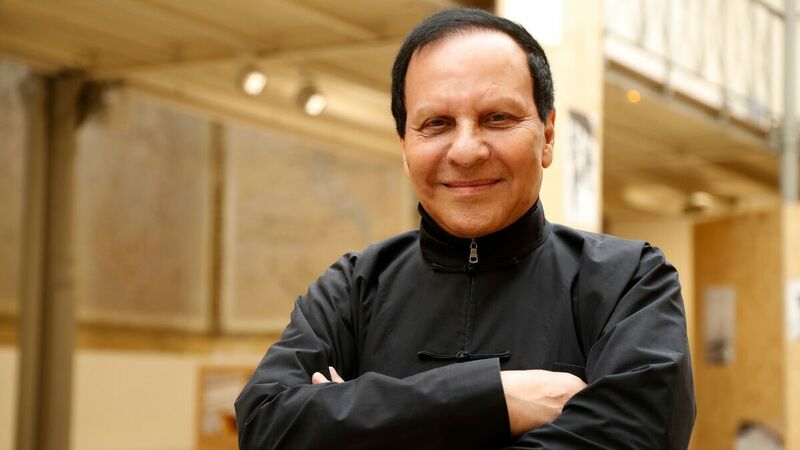 Azzedine Alaia, French Fashion Designer Known As The 'King Of Cling,' Dies : The Two-Way The Tunisian-born designer was known for his body-hugging designs that were sculpted to celebrate the female form. In the 1980s, stars such as Madonna and Naomi Campbell popularized his fashions. Franco-Tunisian fashion designer Azzedine Alaia poses during an exposition of Britain's artist Richard Wentworth photographic work on fashion design on Sept. 7, 2017 at the Maison Alaia in Paris. "I like women," Alaia said in a 2013 interview. "I never think about doing new things, about being creative, but about making clothing that will make women beautiful." Alaia earned the nickname "the king of cling" for his form fitting dresses that were worn by some of the biggest stars of the 1980s and '90s, such as Madonna and the model, Naomi Campbell, who was one of his protégées and referred to him as "Papa." As he updated those designs, his cohort of celebrity fans grew to include Lady Gaga and former First Lady Michelle Obama, who was once criticized by the late designer Oscar de la Renta for wearing an expensive Alaia sweater to Buckingham Palace. Fashion-lovers took to Twitter to pay tribute to Alaia on Saturday. Victoria Beckham called him "a true master" and one of her "biggest inspirations." Dana Delany, the actress most recently known for her role in the TV series Desperate Housewives, tweeted that Alaia "treated the female body as art." The Tunisian Foreign Ministry wrote in a statement that Alaia was born in the Tunisian capital of Tunis in the 1940s. According to The New York Times, Alaia came to Paris in the late 1950s to work with Christian Dior, and he launched his first ready-to-wear collection in 1980. Alaia was known as a private figure, often working on his designs alone in the middle of the night. His company's website describes him as "the little man in eternal Chinese pajamas" for the signature high-necked Chinese suits he often wore. Advertising director Jean-Paul Goude described Alaia in a 2010 New York Times interview as "very, very introverted." "In a way, I find him calculated, and I don't mean that in a bad way," said Goude, who was friends with Alaia since the early '80s. "He knows exactly what he's doing. The silences are on purpose. He doesn't want people to know too much." Alaia's clingy fashions have been celebrated in numerous museums including the Guggenheim in New York, the Associated Press reports. A 2013 retrospective at Paris' Palais Galliera celebrated his way of "slowing down time." Beyond the street and runway, Alaia is forever memorialized in pop culture. In the 1995 comedy Clueless, popular Beverly Hills teen, Cher, opposes a robber's demand to hit the pavement, saying her red dress "is an Alaia. It's like a totally important designer."